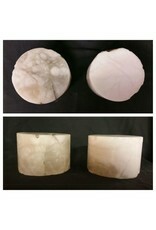 Imported from Italy, these translucent alabaster cylinders are used by students throughout Europe. The carving process has been quickened due to the reduction of the bulk geometric form into round carving cylinders. They can also be used for stone turning on a wood lathe for creating translucent bowls. 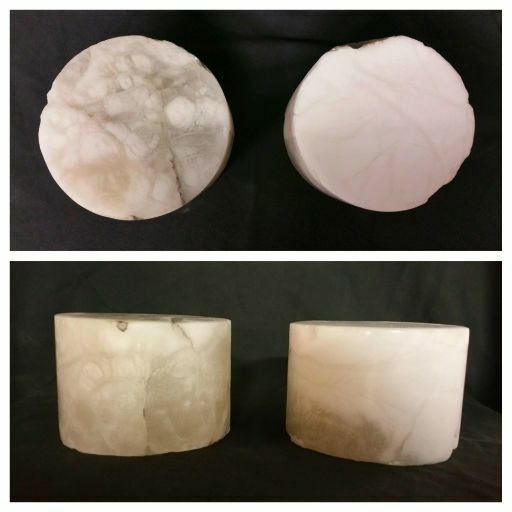 With variations of white opaque with translucent white veins, some are more opaque and some are more translucent. PLEASE NOTE - As with all natural materials there is some variation amongst pieces. The color swatches above are examples of stones and do not represent the colors or patterns of every piece or any piece in it's entirety. Mother Nature controls what is inside the stone and she hopes you will find beauty in them all. There is no bad stone only unrealized sculpture.